There’s a number of reasons why comedians decide on having our constantly unpredictable, financially unstable and socially inactive life. But mostly it’s down to being driven by an innate – albeit odd – need to get up onstage and make people laugh. Some people are born with that and others, like me, had to find it along the way. Regardless of your motivations, the challenge is the same: to earn enough money to carry on doing what you love while getting on with your life. I’ve got a 5-month-old baby so, for me, it’s supporting my wonderful wife and providing for our family. sandwich and a pint in London these days, let alone rent. In the last few years I’ve started a podcast called Partly Political Broadcast. I did it mostly just for fun but also to make more timely jokes without them going to waste. With such a short news cycle and the ongoing sagas of Trump and Brexit, it’s hard to write jokes based on current affairs without them getting old very quickly. The podcast allowed me to riff about all kinds of current topics. It now gets thousands of listeners every week and just this month, while gigging in Hong Kong, I had an audience member tell me how much they loved listening to it! 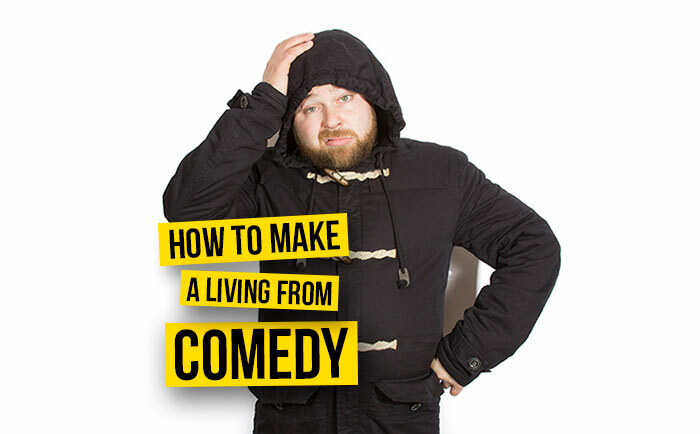 comedians for their tour and TV shows, I’ve recently been writing for adverts too, as well as earning money from my podcast, and participating in radio shows. Then there are new online streaming services, like NextUp – a platform specifically for stand-up. I had a couple of my shows filmed and put them on their platform, gaining me new fans who come to my live shows as well as a regular income for views. In fact, they just sold one of my shows to Audible, sending me a chunk of money I wasn’t expecting. When I was just starting out, my favourite comedian was Ed Byrne. He did a show at my university when I was in my first year and my friends and I laughed so much throughout that we were quoting it for weeks. I was also a big fan of Dave Gorman and wrote to him asking for any advice getting started in comedy. He wrote me a lovely letter back encouraging me to continue writing and trying out material. Years later, I found myself at a show on stage with both Ed Byrne and Dave Gorman, performing my own material. I don’t think there is any other profession where you get the opportunity to work so closely with your heroes. Once I did a gig at Outside the Box in Kingston and I’d been asked to go on later so another comedian could get away early. Just as she finished a rush of darkclothed security guards came flooding into the green room, followed by the one-and-only Robin Williams. He was doing a surprise set just before me! Obviously nervous, I asked him for any advice. He told me a story about a time he ended up performing after one of his heroes, ending the story by telling me how he bombed!